San Francisco and The Bay Area has its fair share of high-tech companies and startups, delicious restaurants, and fun neighborhoods, each with a unique twist. Located near the Pacific Ocean, this iconic city offers so much to residents and tourists alike with places like Fisherman’s Wharf, Pier 39, and Golden Gate Park. With so much to do, it’s hard to get bored here. 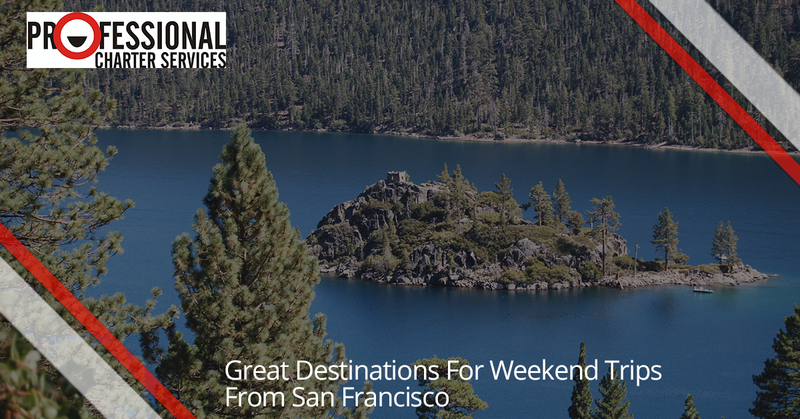 However, if you are looking to get out of The Bay Area and spend some time away from the city, there are plenty of nearby California destinations that make for great weekend trips! If you have a large group looking to take a trip from San Francisco for a weekend, there is no better way to travel than in the comfort of a charter bus rental. There are plenty of benefits of traveling on a charter bus rental for group transportation, and Professional Charter Services has the bus rentals to accommodate your needs. Wherever your destination, our professional drivers will ensure that you and your group arrive safely and on schedule. If you are starting to plan a weekend trip for your family or group, let us help by sharing some of the best destinations in California for weekend get-aways. While Lake Tahoe is most known as a weekend trip destination for snowboarding and skiing, there is so much more to do. Both the winter and summer seasons in Lake Tahoe are every bit as fun and magical, but keep in mind that this destination is known as one of the best summer weekend trips from San Francisco. Both North and South Lake Tahoe offers incredible views, fun activities, and plenty of spots to kick back and relax. You can even explore the Nevada side of the lake! You probably don’t need much convincing to visit San Diego – the sun and surfing are likely enough. San Diego constantly ranks as one of the happiest cities in the United States, and to no surprise, given the incredible year-round weather, 70 miles of coastline, not to mention all of the renowned breweries that serve up some delicious craft beers. There’s plenty to do in San Diego on a weekend trip – see the variety of animal specials at the San Diego Zoo, spend some time at the iconic Balboa Park, or simply spend some time catching some waves and relaxing on the beach. Rather than a weekend trip destination, Big Sir is more of a weekend trip experience. Redwood forests, jaw dropping coastal views, beaches, hiking, and so much more! Big Sur is a coastal region along California’s famous Highway 1, and there is certainly plenty to do; visit the Bixby Bridge, stop by the Mcway Falls, and see the magical purple sand and the iconic Key Hole Arch of Pfeiffer Beach. Whatever is on your itinerary while visiting Big Sur, you’ll be sure to enjoy your time spent in this magical place. Santa Monica is an international tourist destination that is around six hours away from San Francisco. Located at the coast of Los Angeles, this beach city is a superb destination to visit when you are craving a weekend get-away. You’ll find plenty of spots for delicious grub, great shopping spots, the iconic Venice Beach, and you can enjoy some family fun at the amusement park pier. Once you experience Santa Monica, don’t be surprised how hard it will be to leave. The great thing about living in, or visiting, the San Francisco Bay Area is that there are numerous weekend getaways that are just a car or bus trip away. If you are interested in taking a group trip to one of the above destinations, there’s no better way to get there than with a charter bus rental. At Professional Charter Services, our extensive fleet of charter vehicles can take you and your group wherever you need to go! To learn more about destination and reservation options, contact our team of reservation specialists today!